Another year gone, another assortment of big-screen missteps made that should never be repeated again. We get an incredible amount of new releases each and every year, so of course not every film can be a box office hit or Academy Award contender, but the upside to that is there’s always an opportunity to learn from the mistakes. In an effort to make 2014 a better year for film than ever, we bring you 10 things the movie industry should do away with in the New Year. Throw all the horror movie spoofs, celebrity cameos, gross-out jokes and slapstick gags into a trailer you want, but that’s not getting it into the Best Stuff, Scary Movie 5. And, you know what? The same goes to you, A Haunted House! 1. Django Unchained Trailer: Django Unchained rolled into its wide release with a bang. Unlike most of the earlier trailers, this one ditches the Brittle brothers bit and puts the focus on Django’s search for Broomhilda. It’s got a great fresh feel all while keeping in the confines of the world courtesy of the wildly appropriate John Legend tune and unforgettable imagery. Per usual, we receive an insane amount of hype around the reveal of the final Twilight Saga: Breaking Dawn – Part 2 poster only to get a design that we’ve seen time and time again. Sure, the franchise has made the big bucks by delivering more and more of the same, but there’s a trio of movie promotions out this week that win big by getting bold, creative and pleasantly surprising. 1. 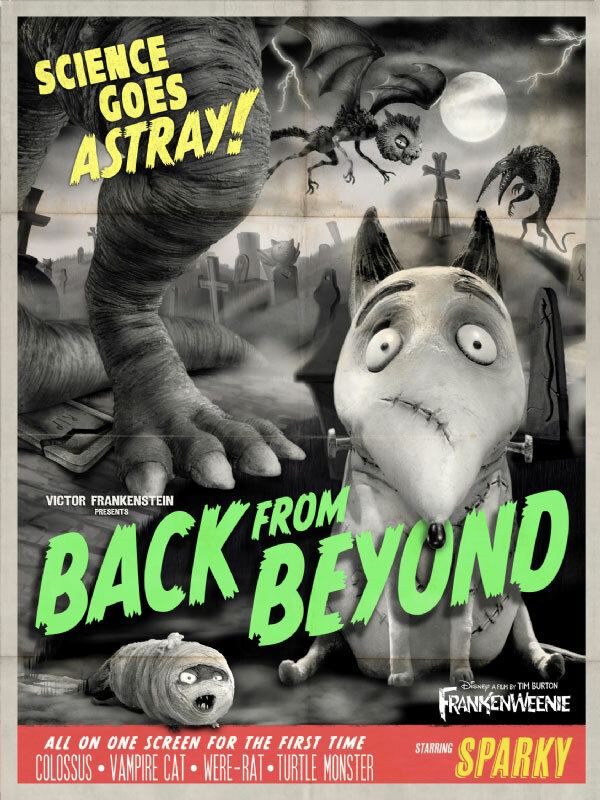 Frankenweenie Pet Posters: You probably know that Frankenweenie is about a kid who brings his dog back to life with a science experiment, but Victor has another hobby: making films. And while that passion has flown under the radar during the movie’s marketing campaign, in the full feature, it’s remarkably charming and brilliantly woven into the narrative. 2. The Lone Ranger Poster: My interest in The Lone Ranger since the film was announced? Zero. My interest in The Lone Ranger since the reveal of this poster? Not much higher than that, but this minimalistic approach gets points for being both a visual success and a nice surprise, far more so than the first trailer.